You need a very secret ingredient and the market is shut. So what do you do? Improvise. 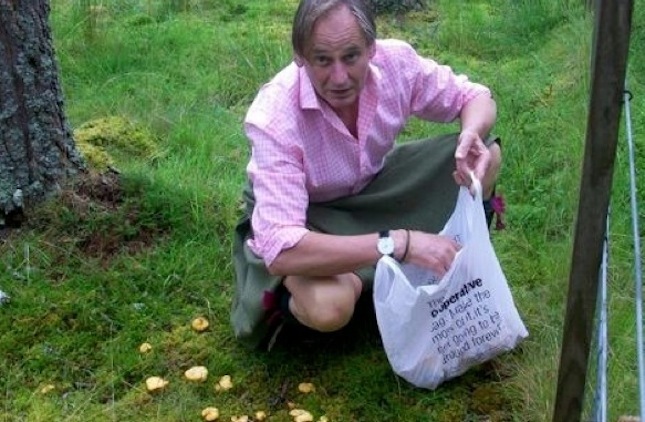 This is me somewhere in remote Scotland ‘sourcing’ some of the mushrooms I needed. I spotted these growing by the roadside on the private estate of one of my clients. And they taunted me to be rebellious … they dared me with their sheer haughtiness to pick them! Of course – please DO NOT try this if you don’t know what you are picking! You need a) a very keen eye, b) a dog called Mouse, c) a kilt, d) a shopping bag … and e) permission! This unique blend of cavalier bush-tucker expertise and devil-may-care bravado is indeed rare. But the results? Mouth wateringly memorable. PS: Love to hear your comments.